Hello there, this Mondo Magnolia stamp set from Ellen Hutson arrived two days ago. I thought the magnolia was just so pretty, I just had to have a quick play with it straight away. I did Google magnolia's as I knew most were white. 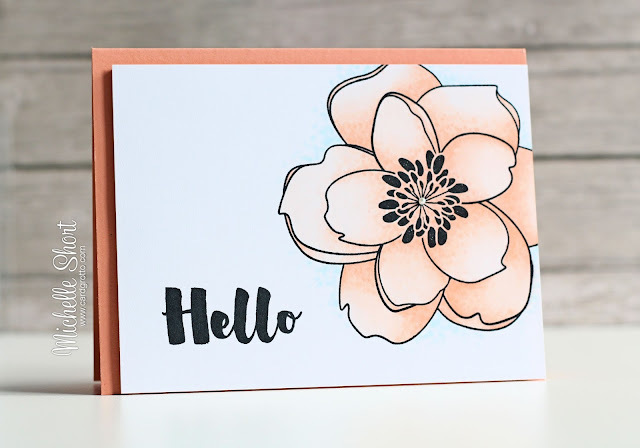 I did find that they come in pink too but went with a peach colour for my card today. I started off by taking a panel of white cardstock and stamping the magnolia image from the set on to it, slightly overlapping on the top, right edge. 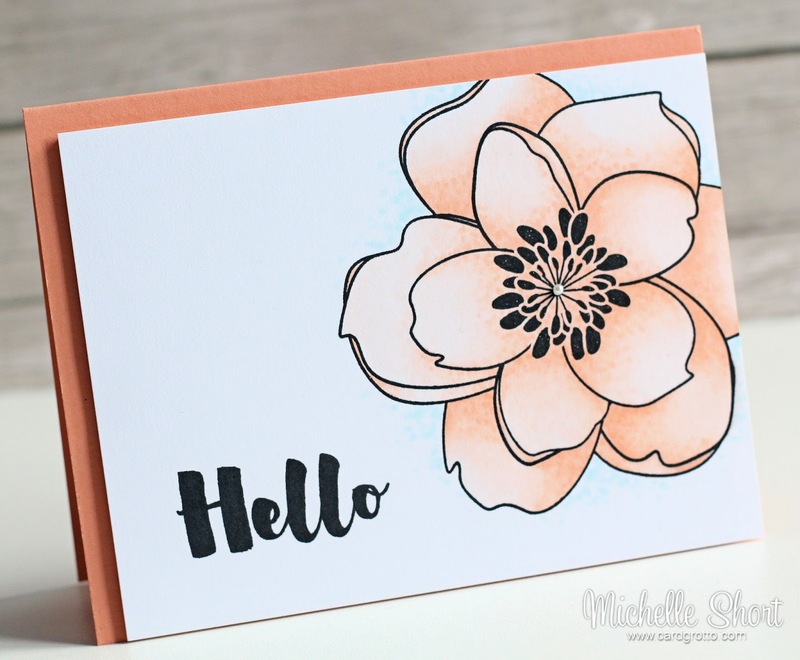 I also stamped the hello form the set in the bottom left. Both of these were stamped with Memento Tuxedo Black ink. I coloured in the flower using Copic Markers, adding some dots, inspired by Jennifer McGuire's latest video. I have used dots many times as backgrounds/grounding but never to colour an actual image. I do like the look! The panel was adhered to an A2 PTI Melon Berry card base with foam tape. I added it towards the bottom right to give a bit of interest in the top left. I added a little clear Wink of Stella to the centre of the flower/stamens and then added a tiny pearl to finish. COPIC MARKERS: Magnolia - YR0000, YR000, YR00, YR01. Outside shadow - B0000, B000, B00. Thank you so much for visiting me today. I hope you all have a great Friday and a great weekend too! Um, what?! Where's mine? lol! Figures it takes longer to get to Canada than the UK! This is gorgeous and I'm really itching to play with it! Your stippled shading is beautiful! Absolutely beautiful. Love your choice of colors. Gorgeous card, Michelle! I love the soft coloring of your flower.